Paragon Park. 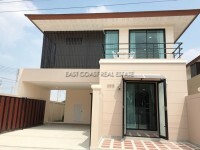 This 'Newly Renovated' home offers a 196 sq.wah land size, have 3 bedrooms, 2 bathrooms plus guest toilet, fully furnished and ready to move in. Massive open plan lounge area connected with European kitchen area. There are oven, gas cooker and washing machine. Air-conditioning throughout. All good sized bedrooms with swimming pool views, all 2 bathrooms are big (bathtub in master bedroom and shower). The property comes with Sala & Sun Terrace plus a nice landscaped gardens, private swimming pool and cover parking. This is a small exclusive village located in the Huay Yai area of East Pattaya. The secure village has clean, wide landscaped roads and all electric cables are hidden underground so you feel at one with nature and the clear skies of Thailand. Each house is private behind 2m perimeter walls so there is plenty of privacy. Available for RENT long term with 2 month deposit (PET is not allowed) and for SALE under Thai ownership with 50/50 on transfer & tax fees. OWNER FINANCE AVAILABLE - CALL US for further information & viewing now!!! Living area : 216 sqm.